1.b create sound policy frameworks, at national, regional and international levels, based on pro-poor and gender-sensitive development strategies to support accelerated investments in poverty eradication actions." Income inequality in India has reached historically high levels. In 2014, the share of national income accruing to India’s top 1% of earners was 22%, while the share of the top 10% was around 56%. Inequality has risen substantially from the 1980s onwards, following profound transformations in the economy that centered on the implementation of deregulation and opening-up reforms. Since the beginning of deregulation policies in the 1980s, the top 0.1% earners have captured more growth than all of those in the bottom 50% combined. The middle 40% have also seen relatively little growth in their incomes. This rising inequality trend is in contrast to the thirty years that followed the country’s independence in 1947, when income inequality was widely reduced and the incomes of the bottom 50% grew at a faster rate than the national average. The temporary end to the publication of tax statistics between 2000–2010 highlights the need for more transparency on income and wealth statistics that track the long-run evolution of inequality. This would allow for a more informed democratic debate on inequality and inclusive growth in India. As per Asian Development Bank "Statistical data on Poverty, India", 21.9% of the population lives below the national poverty line in 2011. Despite the fact that India made tremendous progress in halving its poverty head count ratio by 2011-2012, it still remains at 21% of the population. Nearly 80% of these poor live in rural areas and eradicating poverty is at the core of India’s national priorities. The just-released 2017 Global Hunger Index of the International Food Policy Research Institute (IFPRI) terms India’s condition “serious”, as India Spend reported on October 12, 2017–an improvement from “extremely alarming” in 1990 but not enough to meet the MDG of halving the number of people facing hunger. India has slid three places from the 2014 list and is one of four countries with a fifth of its children suffering from wasting. The Multidimensional Poverty Index (MPI) score is an international measure of acute poverty conceptualised by the Oxford Poverty and Human Development Initiative and the United Nations Development Programme. It classifies as ‘poor’ someone facing deprivation in three or more of 10 indicators, namely: years of schooling; school attendance; child mortality (in the family); nutrition status; asset ownership; access to electricity; improved sanitation; drinking water; flooring; and cooking fuel. In 2014, India was ranked among the 20 countries with the greatest inequality, as per the MPI. 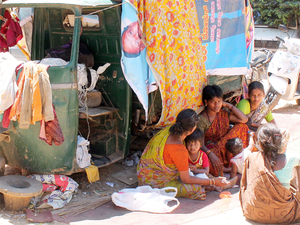 As a result, 343.5 million Indians, more than a quarter (28.5%) of the population, remain destitute. To achieve the SDGs on poverty and hunger, economic growth and redistributive policies must go hand in hand. To make up for the lack of equitable, diversified growth and job creation, India has relied on welfare programmes. The Government of India has many progressive schemes, including the world’s largest employment guarantee scheme, the Mahatma Gandhi National Rural Employment Guarantee Scheme, Deen Dayal Antyodaya Yojana (DAY) -National Rural Livelihood Mission (NRLM) & National Urban Livelihood Mission, National Social Assistance Programme (NSAP) with related following interventions ) Pradhan Mantri Jan Dhan Yojana. 2) Pradhan Mantri Jeevan Jyoti Bima Yojana 3) Atal Pension Yojana (APY). Yet, MGNREGA has its shortcomings. While “we have no doubt that MGNREGA increased the consumption of goods and services among those who participated, the challenge is weak governance”, Prem Vashishtha, senior consultant at the National Council of Applied Economic Research (NCAER) and co-author of the study which was undertaken in collaboration with the University of Maryland, USA, told India Spend.